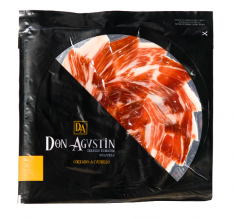 This superior quality whole Ibérico shoulder ham from Don Agustín is a product of the hindquarters of the Ibérico pig, and is characterized by its stylized form, the black hoof and the marbling infiltrating the tissues and contributing to its stunning flavor. The color is red, with pinkish hues. In the mouth, it's flavor is intense and prolonged, and unlike anything else on earth. 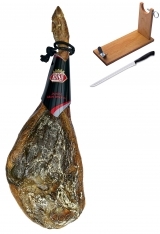 t's a limited production item, and is selected from the finest Ibérico pigs which feed on acorns in wild pastures. Combined with an extremely long and careful cure, this produces a gastronomic jewel - a true treasure of Ibérico hams, and of Spanish gourmet cuisine. In Spanish, this product is called, "Paleta ibérica de bellota Don Agustín Calidad Superior entera." Format : Your shoulder ham will come in a presentation box, in a stylish black bag and with a red cotton interior wrapping. Storage : You should store this shoulder ham in a cool, dry place.